Never Enough Nails: Lynnderella Friday, Vol. 56! It's witching season over on lynnderella.com and I have two of the new Halloween polishes to show you today, as well as two minty fresh cuties. 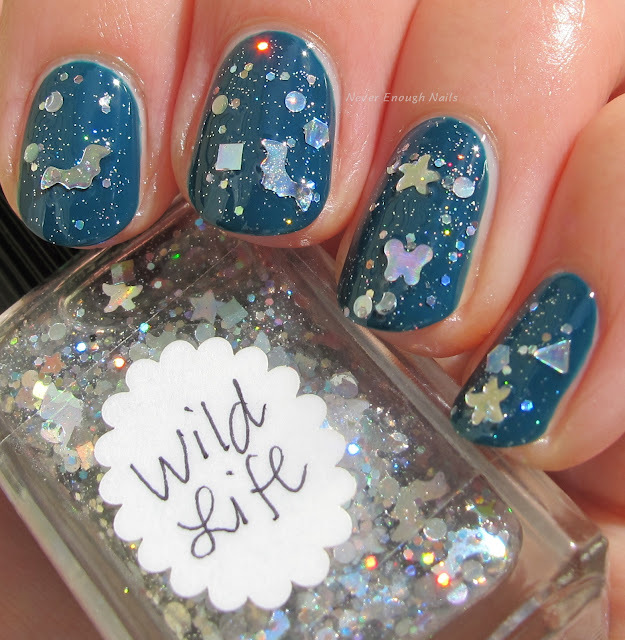 Lynnderella Wild Life is one of the five polishes released in the Season of the Witches collection. 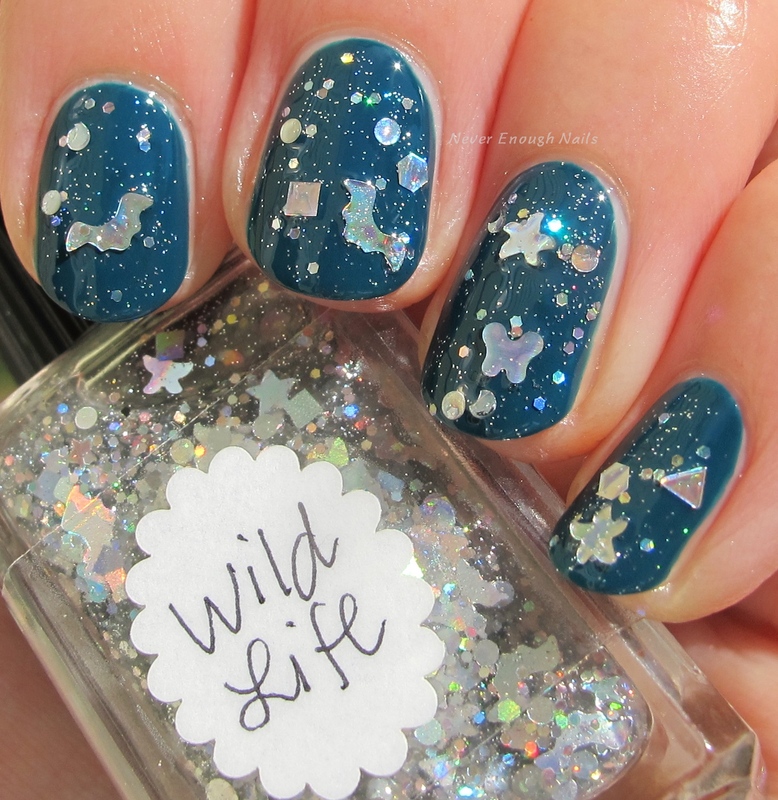 It contains silver holographic glitter in a menagerie of shapes- bats, starfish, fish, penguins, butterflies, and Mickey glitters with smaller silver holo accents like circles and squares. I love the bats, they are SO cool!!! 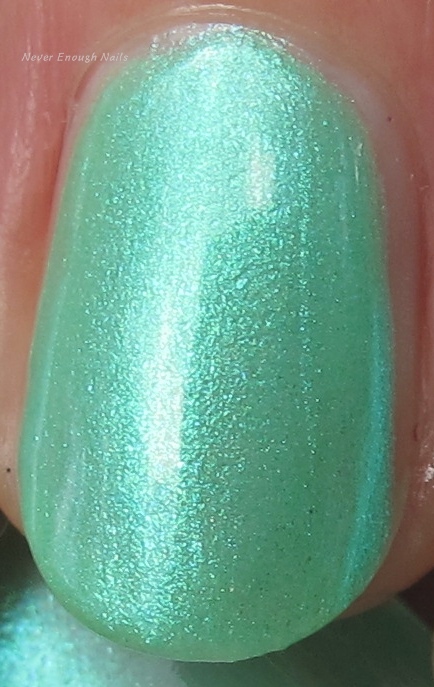 This is one dabbed coat over Dr.'s Remedy Timeless Teal. It was pretty easy to apply, I did have to angle the bats a bit to stay flat on my small nails. But it wasn't hard and I love having holo bats on my nails!! Lynnderella Witchy's Blushing! is a stunning bright acid green shimmer with chartreuse microglitter accents. It's my new favorite green and will be perfect for Halloween-themed manis. Because it's shimmer based, it looks nice and smooth, never lumpy. The holo microglitter really pops against the acid green. This is two flawless coats. I didn't even do any clean-up, it was perfect. I used one layer of top coat and it had a nice glossy finish. A++++! 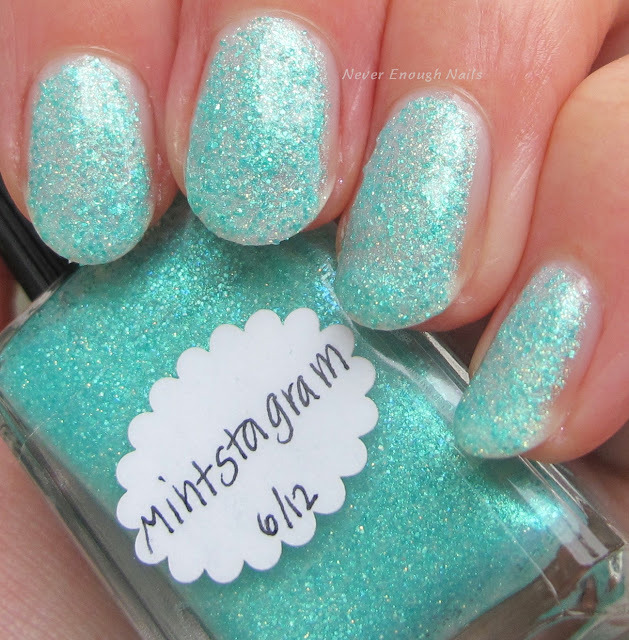 Lynnderella Minstagram is a new LE with lots of small matte mint green glitters, iridescent and mint accents in an aqua shimmered base. The shimmer is super reflective and pretty!! This was three thin coats. It was still a bit sheer after two coats. I didn't want to do two thinkers coats, because the glitter is so plentiful, it could end up looking textured or bumpy. But three thin coats hit the spot! Lynnderella Minterest is a shimmery mint with aqua, green, turquoise, cyan and mint shimmers. 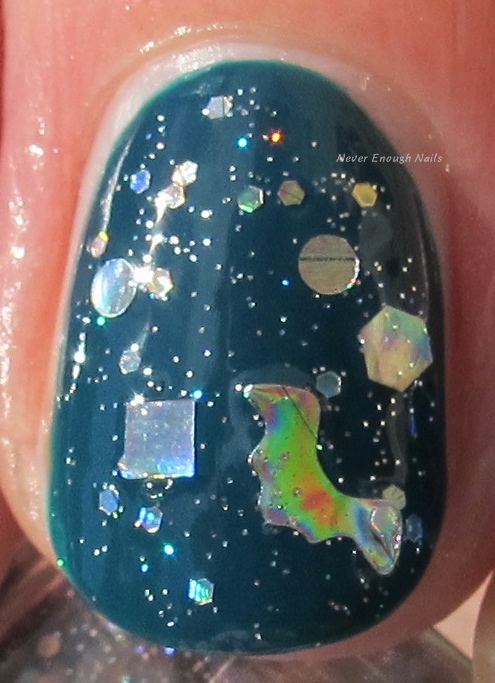 The shimmer is beautifully complex in this one and can make the polish look a bit more green or more blue depending on lighting. Beautiful!! This is also three thin coats. Two had a touch of VNL, but it built up nicely with the third. The formula was lovely, a great consistency. The Season of the Witches polishes are available now on lynnderella.com. I purchased two more of those myself, so I will have swatches of those next Friday. 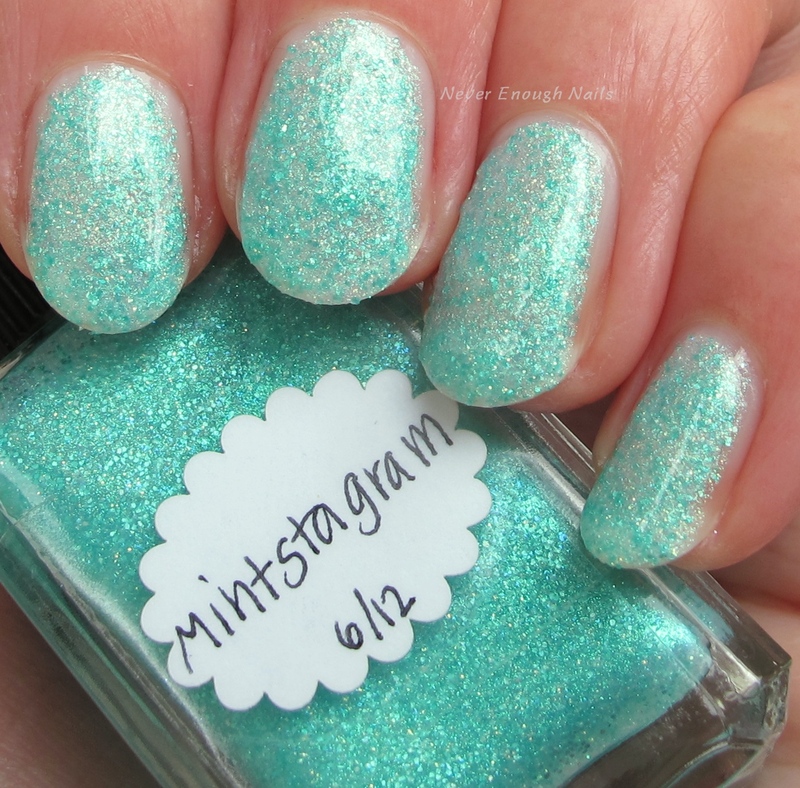 Minstagram and Minterest are available now at http://stores.ebay.com/lynnderella-lynnderella.